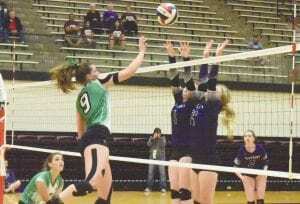 Pleasanton’s volleyball team broke through to the regional semifinals/ peaked out in its second straight regional quarterfinal. The Eagles (34-10) lost 21-25, 23-25, 20-25 in another close match with district foe Geronimo Navarro in the regional quarterfinal on Nov. 6 at the Blossom Athletic Center in San Antonio. The Eagles had strong rallies in each set, but were unable to close them out. Pleasanton led 21-18 in the first set before Navarro scored the last seven points. The Eagles trailed 11-4 early in the second set before scoring six straight points to set up a back-and-forth battle that lasted until the end of the set. Laken McAda had a kill as the Eagles scored a pair of points for a 22-21 edge. But Navarro took the last two points of the set following a tie at 23. Pleasanton swiftly beat La Feria 25-15, 25-19, 25- 14 in the area playoff at Calallen High School in Corpus Christi on Nov. 1. 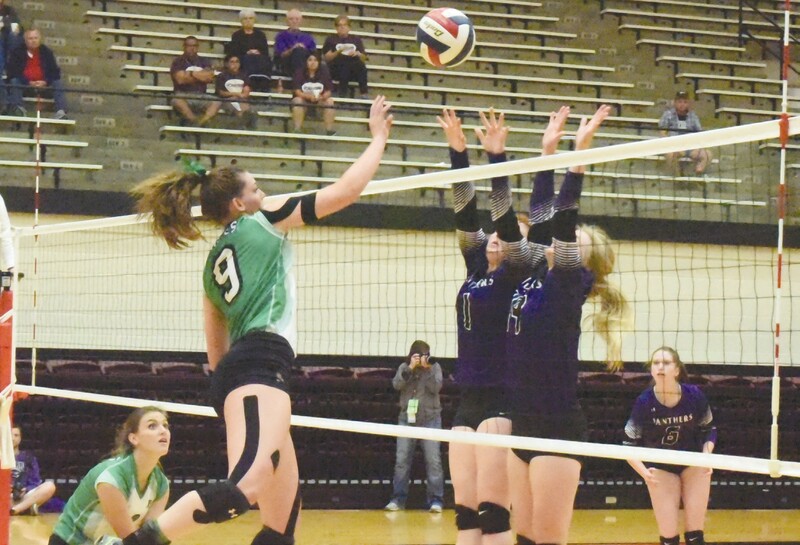 In contrast to Navarro, which Pleasanton had played twice in the regular season, captains Laken McAda, Kaycie Shannon and Madison Mc- Donald described La Feria as a mystery entering the match. McAda said they “went in blind” and Shannon said they were unable to find video on the team. After a bit of back and forth to start the first set, the Eagles went on a 10-1 run, including two kills and an ace by Kaycie Shannon, for a 14-5 lead. The Eagles won 10 of the last 13 points of the set. Pleasanton opened the second set with an 8-2 spurt. Laken McAda had two straight kills during a 5-0 run that gave Pleasanton a decisive 17-11 lead. Pleasanton started the third set with a 6-2 lead. For the sixth point, Madison McDonald made a save while kneeling on the floor and following a hit back from La Feria, Chloe Bryant deposited the ball in the middle of La Feria’s side of the court. McAda said the team had adjusted after La Feria started pushing the ball into spots where it is not used to playing. Shannon had 18 kills and a block. Madison McDonald collected 31 assists, 12 digs and two aces. Chloe Bryant led the team with 17 digs. Sarah Neill had 13 digs. McAda had 13 kills.